The concept is fascinating but if I have to choose between pixel-based ads being a fad or a trend I would have to say fad. I just checked out PixelBay.org, one of the companies in this space and was fascinated o see so many ads. Some of the ads reminded me of messages I get in my inbox as spam, making me wonder if there is a need for legitimate advertisers to ever use such a service. The cost is so low that I am sure advertisers are drawn to the concept just to see if it works. How low? Try $1 a pixel for five years. In the case of PixelBay the company touts the fact that it will drive traffic to its website in large numbers. A look at the Alexa Rankings of the site show that while traffic spiked for a while, it is on the way back down now. Alexa ranks sites as closest to the #1 most visited site on the web so the lower the number the better. PixelBay broke the 20,000 mark for a while but has settled more recently at 38,407. "Things that have no benefit to the consumer don't last very long. They can survive on curiosity and novelty for only so long," said Jim Nail, analyst at Forrester Research, Cambridge, MA. In short, unless the company and others can find a way to attract people to the concept will most definitely remain as a fad. The cost is so low that I am sure advertisers are drawn to the concept just to see if it works. How low? Try \$1 a pixel for five years. In the case of PixelBay the company touts the fact that it will drive traffic to its website in large numbers. 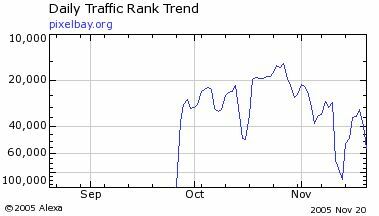 A look at the Alexa Rankings of the site show that while traffic spiked for a while, it is on the way back down now.